The Plymouth Plaza was the division’s base model for 1954 and only slightly revised from the discontinued Cambridge. It was initially powered by a 217 cid flathead six-cylinder, generating 100 bhp, but in March a new “PowerFlow” engine was offered. It was a 230 cid six that delivered 110 bhp and could be had with the PowerFlite automatic transmission. Other transmissions included a three-speed manual with optional overdrive and a Hy-Drive semi-automatic. Power steering and power brakes were available. The Plymouth Plaza was practically devoid of brightwork and was the company’s workhorse, with the Savoy and Belvedere serving as the more upscale series. Plaza was available as four-door sedan, two-door club coupe, two-door business coupe and two-door suburban wagon. Sales totaled 76,053 of the company’s 433,000 annual sales, with 43,077 sedans, 27,976 club coupes, 5,000 business coupes and 35,937 two-door station wagons. Best seller for the year was the mid-range Savoy sedan with 139,383 units sold. For 1955 the entire Chrysler range was restyled by Virgil Exner and the Plymouth Plaza shrugged off its 1951 lines. It was still plain, but a longer, lower body had straight-through fender lines, and the windshield and rear window curved round to the A and C pillars.Front fenders were hooded over headlights and the grille featured horizontal bars. Buyers were able to order side trim after mid year, push button door handles were introduced, a dashboard mounted automatic shifter introduced, and suspended pedals fitted. A 117 bhp, 230 cid six was standard, but a 157 bhp 241 cid V-8 was optional as well as 167 bhp or 177 bhp 259 cid V-8s. Plymouth Sales shot up about 85 percent as the economy rebounded and annual production was 672,100. The Plaza series offered a four door sedan, a two-door club sedan and two-door business coupe and a two-door and four door station wagon. Best seller was the Plaza sedan, with 84,156 buyers, while the two-door club coupe attracted 53,610 owners. 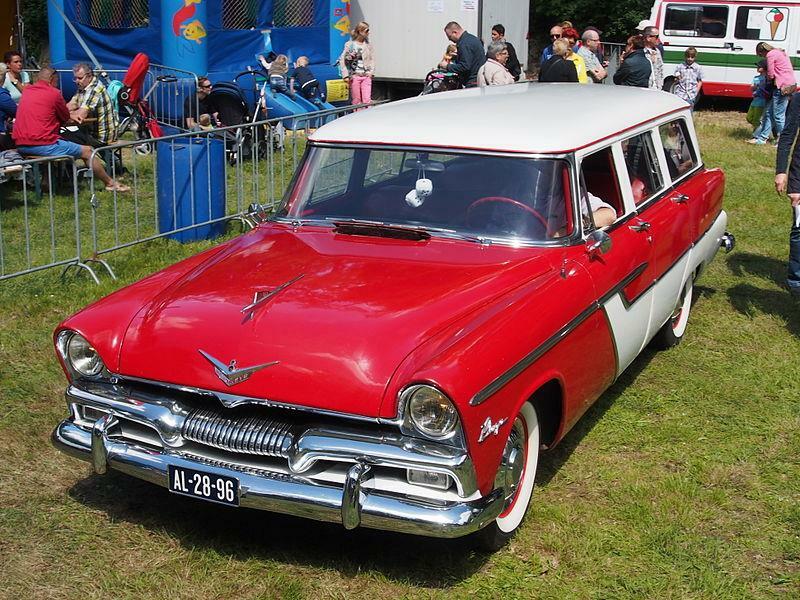 The two wagons totaled 47,230 sales, though buyers preferred the two-door at a rate of two-to-one. The 1955 body continued through 1956, with the addition of more bright work, two-tone paint and fins. Electric systems were now 12 volts and the automatic transmission a push-button. Plaza remained the basic series but the Deluxe suburban was trimmed like a Plaza. Annual sales dipped a little to 521,000 in 1956. Plazas could be bought with six-cylinder or V-8 engines. Plaza offered a four-door sedan, two-door club sedan, two-door business coupe and two-door deluxe suburban wagon. Top seller was the sedan at 60,197 followed by the club sedan at 43,022, the suburban at 23,866 and the spartan business coupe at 3,728. The year 1957 showed a small 5.4 percent gain in sales, but Chrysler’s revolutionary lineup jumped 41 percent. After Exner’s “Suddenly it’s 1960” lineup, Plymouth sales increased 44.3 percent, making the division number three again in the sales race for the first time since 1953. The cars featured bold curves and big fins with hooded headlights, and torsion bar front suspension was introduced. The Plymouth Plaza offered a four-door sedan, club coupe and business coupe, two-door deluxe suburban and even a taxi. The 230 cid six was joined by a 276 cid V-8 with 197 bhp. Top-selling Plaza was the sedan with 70, 248 sales, followed by the club coupe with 49,137 buyers. The recession took hold in 1958 and car sales plunged. Plymouth dropped to 443,799 units but the division remained number three because everybody else did worse. The new cars had four head lights and horizontal bar grilles, bigger front bumpers and different side trim. This would be the last year for the Plaza, which offered five models: sedan, club coupe, business coupe and two deluxe Suburban wagons – a four-door and two-door. The sedan recorded 54,194 sales, the club coupe 39,062 while the business coupe managed only 1,472 buyers. Suburban wagon buyers bought 31,160 units, almost evenly divided between two- and four doors.